Twilight Time only started releasing DVDs and Blu-rays last year, aiming for classic older movies that the big studios have neglected. Their remit has stretched to titles as recent as As Good As It Gets (1997) and the original Fright Night. It's surprising that the studios don't think Ray Harryhausen films still sell, for instance. Twilight Time are particularly interested in the widest of widescreen movies getting the best presentation possible, on Blu-ray. In the 1950s and 1960s, hugely expensive epics were filmed in the new process of Cinerama and other aspect ratios of around 2.35:1, to make movie-going more immersive with bigger-than-ever screens (to combat the rivalry from television). The spectacle wasn't just used on westerns and Roman historical epics, but action (like Grand Prix) and comedy (Those Magnificent Men In Their Flying Machines, It's A Mad Mad Mad Mad World). Viewed on a big screen, DVDs struggle to offer enough detail for these aspect ratios, and for some movies these Blu-rays offer their widescreen debuts on home video. Obviously I've pounced on their monster movies. 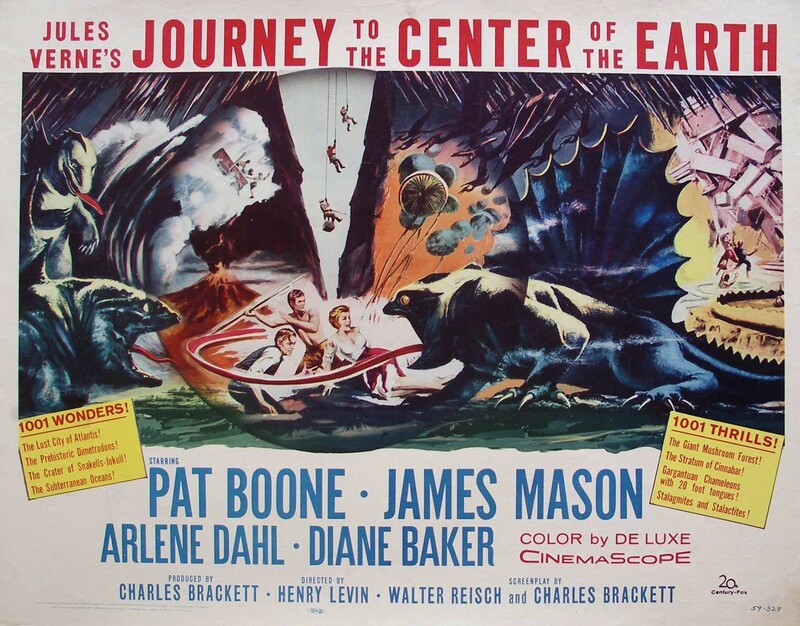 Journey to the Center of the Earth (1959) can't compete with Jurassic Park, but was the equivalent family adventure of the time. Some, not all, of the special effects still work. The spectacular production design offers imaginative large-scale sets, expanded by imaginative matte paintings. For two hours you can almost believe it's possible to hike to the Earth's core! This science-fantasy is a fairly faithful adaption of Jules Verne's novel. But pandering to fans of the book means a fairly slow slog before the journey downwards begins and the small-scale melodrama turns into a unique cinematic adventure. Bizarrely, there's even a song to clog up the early proceedings, reflecting perhaps what was then expected of family entertainment. Disney had previously made 20,000 Leagues Under The Sea (1954), epitomising the approach to family adventure stories for years to come. Another Verne adaption, it starred James Mason as Captain Nemo, no doubt making him a must for the leading role of Lindenbrook. Amongst the colourful stalactites and giant mushrooms, there are dinosaurs and a rival expedition to compete with. I was surprised to see a couple of story details pre-empting Raiders of the Lost Ark. A configuration of the Sun's rays leading the way, and a large rolling boulder chasing our heroes. Like The Lost World adaption the following year, the dinosaurs are portrayed by live lizards, but here a little more convincingly. The dimetrodon attack still looks pretty frightening. Am I going soft! To contrast with the family-friendly wholesomeness, the amount of beefcake is a little surprising. 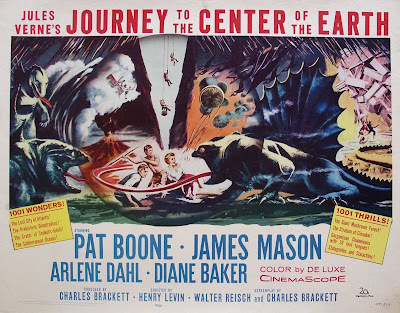 As the expedition gets closer to the Earth's core, it gets pretty warm, so both Pat Boone and Peter Ronson get half-naked, revealing a smouldering amount of tanned manflesh, and get racily drawn towards the maternal figure of Arlene Dahl. The experience is that much more impressive due to an awesome soundtrack from Bernard Herrmann, only a year after he scored Vertigo. The drama is certainly lightweight, but mounted on such an impressive scale that it remains epic fun! 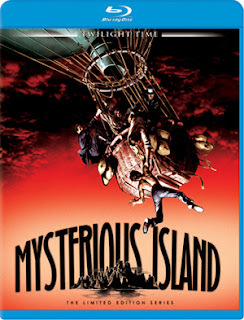 Stranger still, this Ray Harryhausen spectacular, Mysterious Island (1961) should also be released by an independent. It features a wide range of iconic Harryhausen creations - the giant crab, giant bees, a prehistoric chicken (a phororhacos) and more! Like many unknown island stories, the plot is skimpy, building up with episodic encounters. The lengthy set-up of the explorers escaping from a military prison during the American Civil War has no real bearing on the rest of the story. But there's an enjoyable twist, a tremendous Bernard Herrmann soundtrack and many examples of Harryhausen's unique special effects sequences. This release improves on the cramped aspect ratio of the previous (2002) DVD release, with fuller colour and more picture visible at the top and bottom of frame, closer to the 1.66 aspect ratio. And of course it's now high-definition. 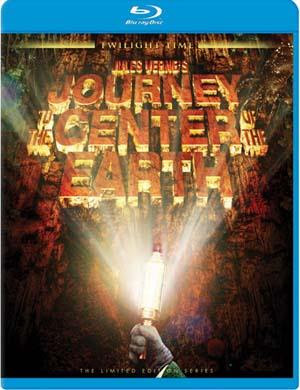 Sorry to tell you that both Mysterious Island and Journey to the Center of the Earth are now sold out. 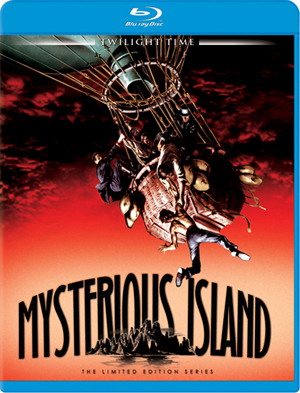 A longer review of Mysterious Island on Blu-ray over at Black Gate.